VietNamNet Bridge - On December 5, Navibank Saigon FC declared its dissolution because the FC did not find any sponsor. 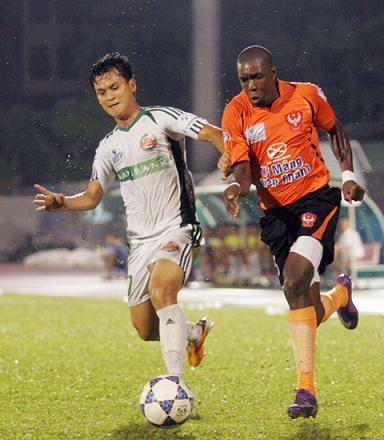 Meanwhile, Saigon Xuan Thanh FC is unlikely to attend the 2013 football season. After Navibank stated to return the Navibank Saigon FC back to the HCM City Football Federation, the Ninh Binh-based Xuan Thuy Investment and Development Corporation bought the team at the price of VND21 billion ($1 million). However, Xuan Thuy just purchased the team for commercial purposes rather than investing in the team. After Hai Phong refused to buy it, Xuan Thuy planed to give the club to Ha Tinh Province but Ha Tinh leaders also refused to take it. In the last two months, Saigon Xuan Thanh FC’s CEO Tran Tien Dai, a reputed football broker, tried to look for a partner to transfer Navibank Saigon. The team’s price was slashed from VND10 billion ($500,000) to VND5 billion ($250,000) but no company wanted to buy it. The HCM City Football Federation did not want to keep this club. Not being sold, on December 5, Dai announced to dissolve Navibank Saigon. According to Dai, five players of Navibank Saigon have been employed by Saigon Xuan Thanh FC, including Quang Hai, Tai Em, Long Giang, Viet Cuong and goalkeeper Quoc Cuong. The transfer price is only from VND200 to VND300 million ($10,000-15,000) per player. The remaining players will be facilitated to end their contracts with Navibank Saigon to find a new job with other clubs. Earlier, Hanoi FC and Young Hanoi FC, owned by the arrested banker Nguyen Duc Kien, were dissolved. CEO Tran Tien Dai also said that Saigon Xuan Thanh FC’s attendance at the 2013 football season is still open because of financial problems. "We are in economic difficulties. Thuy (the FC’s owner) said to cut down funding for the team by 45% compared to the previous season. The club still owes some players four months' salary. We have asked for help from the Ho Chi Minh City authorities, but we have not received a response. Therefore, the FC may not compete in the next football season," Dai said. Meanwhile, Ninh Binh FC may be also dissolved. A few weeks ago, some players went on a strike and the club’s owner was intended to disband the team. Also on December 5, Truong told correspondents that he was depressed with football. He is more likely to disband Ninh Binh FC. The situation at the the First Division and V-League clubs is now very complex. It is rumored that Khanh Hoa FC will be sold to Hai Phong. Ba Ria - Vung Tau FC which has just got a card to the First Division Tournament 2013 has just been disbanded due to lack of funds. Previously, because of the economic difficulties of football teams, the organizers of V-League and First Division Tournament delayed the registration deadline of the 2013 season from November 3 to December 8. However, the situation has not been improved. The chief organizer Tran Duy Ly said until December 8, the organizing board can determine the participating teams and then make specific plans for the new season.